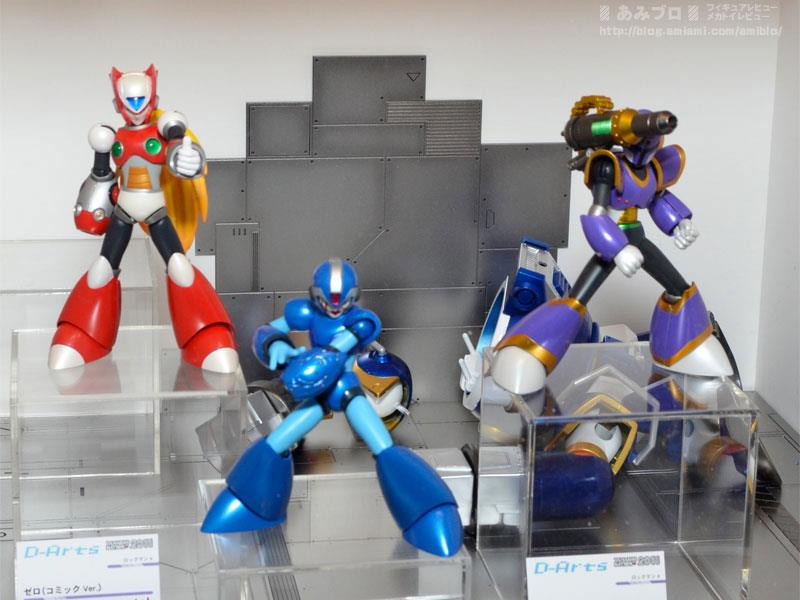 Rockman Corner: D-Arts News Round-up: Comic Version Zero Revealed, Ride Armor Confirmed? D-Arts News Round-up: Comic Version Zero Revealed, Ride Armor Confirmed? Aside from the apparent confirmation of a Z-Saber, we've no word on additional accessories and doodads set to ship with Zero Type 2. Same goes for Vile; no indication of accessories, pricing, and release date just yet. I imagine that news will be coming along shortly. Even so, there they are in vibrant color. Also spotted at the exhibit, a D-arts Zero "Comic Version" and... a Ride Armor? The marker below Zero there indicates a THIRD D-Arts Zero is in the works, and much like Comic Version X, it will be based off of Yoshihiro Iwamoto’s interpretation of the character. Speculation says the figure could go on sale tomorrow alongside Comic Version X, but we've no official confirmation on that. Click here for a close-up. And then there's that Ride Armor conveniently placed behind Vile. It's hard to say at this point if the figure will actually be sold, or if it's nothing more than part of a promotional display. Bandai has been known to decorate D-arts displays with items and knick knacks that never made it to retail. Hopefully that's not the case. Stay tuned for more D-Arts news shortly! "Bandai has been known to decorate D-arts displays with items and nick knacks that never made it to retail." So no power-up capsule like the one shown before? Bandai could release it with a transparent Dr. Light figure. Wow! Those look amazing! I want my D-Arts Vile and Zero 2.0 now! inb4 bitching about how it isn't perfect or mindless hating on jazwares. Hey man, after checking more the photography, I think the ride armor is EXACTLY the old Bandai figure. Vava's design seems like it's based from Irregular Hunter but it has Sigma logo on his helmet.. Hmm.. In any case, can't wait!!!! Gotta have em all!! Vile looks very cool too! I'm surely going be getting him! But Zero, I guess too, the only thing bugging me is that his Z-saber should of been in green. I think Zero version 2 is going to be coming with his Z-Buster from X2 too. You can see it slightly behind his leg in the picture of where's he's slashing. Zero V2 looks good, but I hope that design is not final. He looks a little unfinished, the paint is off a little and there are some rough parts on his arm. Also, his forearm armor doesn't seem to fit together right. Hopefully this is just a mockup prototype that will go through some more final touches before full production. @turianx9: Umm... That is Zero's final. He's no longer in proto form or mock up and such. He's finished. He might seem to be off color due to the lighting. But that's him. And trust me that's the best of the Zeros that you'll ever see, for once you get yours, it's going to be bad, with possibly faulty joints and paint errors as they say. Enjoy what you see cause yours, ours, is not going to be like this. what's the best place to buy D-arts figures? "So no power-up capsule like the one shown before? Bandai could release it with a transparent Dr. Light figure." That would be wicked sweet, but alas I doubt they'll ever do that. 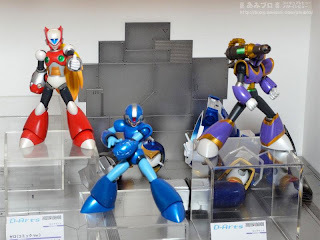 Glad to see Bandai is making more of these fantastic D Arts figures...I just hope they get around to making a Sigma or X2 armor...then I'd be all set. I... I think I'm going to cry. Zero Type 2 is looking so... beautiful! :') I'll definitely get it sometime after the figure is released. And an "Iwamoto-styled" Zero figure? Hmm... C00L! It probably won't come overseas, as the Iwamoto-styled X didn't, either. Oh well... still real awesome to see! OHH YESS~ Zero V2 I've been waiting for you!